Home » News » Jayant Venkatanathan defends PhD! Congratulations to Jayant Venkatanathan who defended his PhD on March 17, 2015. His opponents were Luis Caricco (University of Lisbon) and Jean-Bernard Martens (Eindhoven University of Technology). Jayant’s thesis was entitled Examining the Interplay Between Universal Behavioural Tendencies, Online Social Networks and Social Capital. You can read more about his thesis in this post. Photo: Taken shortly after Jayant’s defense with the members of his jury. 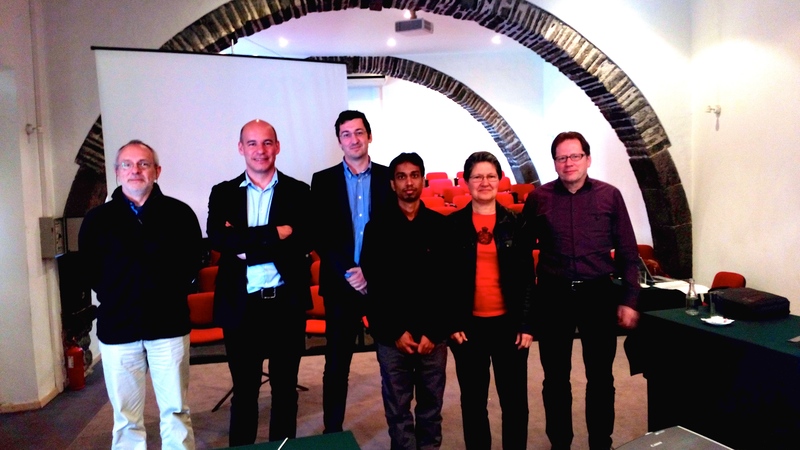 From left: Luis Caricco, Nuno Nunes, Enagelos Karapanos, Jayant Venkatanathan, Maria Teresa Gouveia, Jean-Bernard Martens. (Missing from the photo is Vassilis Kostakos). « Jakob Rogstadius defends PhD!